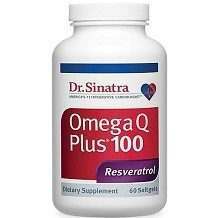 Here we review Dr.Sinatra Omega Q Plus 100. This Omega-3 supplement promises to support blood pressure, heart, and circulatory health while aiding in the maintenance of proper cholesterol levels and increasing energy. There is much to like in this ingredient list. Squid oil is a decent source of Omega 3s. L-Carnitine supports heart health, Coenzyme Q10 helps convert food into energy and Trans-Resveratrol is gaining attention as a possible antioxidant. While many of the secondary ingredients are benign, some give us pause. Gamma Cyclodextrin is a food stabilizer and medicine carrier. While often harmless, it may be linked to stomach upset and liver damage. Cyclodextrins may cause nausea and stomach upset. Medium Chain Triglycerides are a digestive aid. However, they are contraindicated for people with liver damage and may cause stomach upset. Annatto seed extract is a plant-based colorant that may interfere with blood sugar. Diabetics should exercise caution in its use. In general, we prefer a simpler ingredient list. The manufacturer suggests taking two capsules one to two times daily, with a meal. It is dangerous to take too much of any product. This rather large range may result in some consumers ingesting more than is healthy. Also, some reviewers found the gel capsule to be large and difficult to swallow. In addition to the possible side effects noted above, reviewers have complained of headaches and stomach upset. More seriously, several consumers reported a rise in the levels of LDC “bad” cholesterol, blood sugar, and blood pressure levels. We would hesitate to purchase any product that may worsen the condition it is supposed to treat. The manufacturer sells Omega Q Plus 100 in one, four and seven bottle amounts, with a discount for bulk purchasing. The prices for these packages are $49,99, $149.97, and $249.95 respectively. It is also available in varying amounts and prices from retailers. The manufacturer offers a fairly standard 90-day money back guarantee. There is no mention of product condition necessary for a successful return. We found some things to like about Omega Q Plus 100. 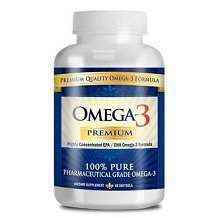 It has a recognized source for Omega 3s and additional ingredients that may support heart health. Unfortunately, there are more things we dislike. Perhaps the first of these is extensive secondary ingredient list. While some of these are harmless, others have possible side effects that may range from discomforting to dangerous. It is extremely important to carefully manage heart health and cholesterol levels, so it is concerning that the dosage instructions covered so wide a range. This ambiguity may lead to a consumer taking too little or too much of the product. The first could be valueless, the second, dangerous. Finally, and most concerning, were the consumer-reported side effects of increased cholesterol, blood sugar, and blood pressure levels. No supplement should worsen the condition it is supposed to treat. After careful consideration, we cannot recommend this supplement.